Many common skin problems are linked to an excessive build-up of dead skin cells. This not only congests pores, but also makes the skin thick, rough and dull-looking. Skin peels and microdermabrasion resurface sluggish, sun damaged and ageing skin, dramatically reducing lines and wrinkles, acne and hyper-pigmentation. These procedures can also help your skin to appear healthier, plumper, tighter and more radiant. For even greater results, your Aesthetician may suggest combining skin peels with microdermabrasion. A highly effective treatment for dull and sun damaged skin, acne scarring, age spots and wrinkles. Customised medical strength tricholoroacetic acid (TCA) is applied to the skin's surface to achieve a deeper level of peel, removing damaged surface cells, stimulating the skin's metabolism and boosting the production of healthy new cells and collagen fibres. Skin is smoother, tighter and regenerated. Tomorrow's peel requires a period of 2-4 weeks pre peel program. For the precision treatment of wrinkles, age spots, acne, sun damage and loss of tone on the face and body. Effective for all skin types and colours. Designed by Beverley Hills surgeon Dr Zein Obagi, a customised concentration of trichloroacetic acid (TCA) is mixed with a stabilising blue base to allow slow, controlled penetration to an appropriate depth, which your Doctor monitors. The aged and damaged surface skin is removed and replaced by smoother, healthier cells allowing the skin's natural clarity and firmness to resurface. Patients will need to use the Obagi Nu-Derm System for at least 6-12 weeks prior to a Blue Peel. Perfect for dull, oily blotchy or sun damaged skin, minimising the appearance of fine lines and wrinkles, crow's feet, age spots, enlarged pores, uneven skin texture and blemishes. Densely packed real diamonds are propelled over the skin's surface to exfoliate and remove dead cells, while an adjustable suction operates at your comfort level to stimulate blood flow for optimal exfoliation and skin rejuvenation. 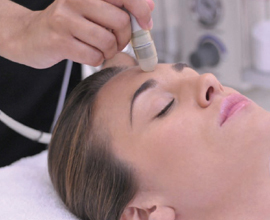 This treatment is enhanced by a relaxing facial and customised mask. Visible results can be seen from the very first treatment, although a series of treatments is recommended for ongoing improvements. A deeper resurfacing treatment for sun-damaged skin with established line and loss of smoothness and tone. Our professional GloChemical exfoliation treatments provide customised programs for your individual skin type and concern. Designed to achieve a deeper level of exfoliation and skin resurfacing, stimulating a fresher complexion and improving the appearance of fine lines, imperfections and discolouration. A series of treatments is recommended for optimum results, your Aesthetician will tailor your treatment plan to your skin's needs. Ideal for treating thick, dull and sun damaged skin, acne scarring and hyper pigmentation. The surface exfoliation of diamond microdermabrasion removes the build up of dead cells, allowing the GloChemical solution to penetrate more efficiently. Results are highly effective.